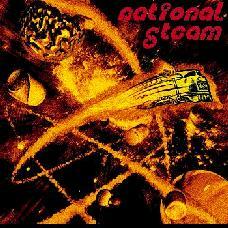 On the heels of two cassette releases National Steam introduces its first full length CD. A companion project to label mates Quarkspace, the band consists of Paul Williams on percussion, loads of keyboards, effects, and vocals, and Dave Wexler on guitars and effects. This self-titled debut offers up eleven tunes, six of which are improvised space journeys and sound experimentations. The opening track, "Pennsylvania Special" is a reworking a the same song from their Steamdreams 1 cassette. At the heart of the tune is the repeated pounding piano melody and the competing keyboard and guitar work that accompanies it. A much fuller sound on this version transforms the train journey feel of the original into a galactic Siberian Railway. "Orion" and "Ode To Death" both feature vocals by Paul Williams. "Orion" with its funky head-bopping beat and wah wah guitar also has some great mellotron-sounding work. "Ode To Death" opens with an intense orchestral sound and screaming guitar lines and then is accompanied by the most Peter Hammill vocals I've heard since Peter Hammill. A powerful tune. "The Sutler" is somewhat different from the rest of the CD and will appeal to prog rock fans as much as space fans. Guests Pat Wise and Teresa Owsley's sharply contrasting vocal styles make for welcome variety throughout the song. Wise's vocals are dark and perhaps somewhat evil sounding while Owsley has a style that is operatic and not unlike Kate Bush. An intense, hard driving song, the music takes a turn during the last two minutes during which Dave Wexler's guitar takes front and center. His solo finale is speedy, soaring, and beautiful in a way that will make prog fans drool. The remaining tracks are all instrumental and mostly improvised. For those who are new to the Quarkspace / National Steam camp you should know that all the Eternity's Jest musicians have been playing together for a long time and it was an affinity for improvisation that lead to Quarkspace's development. On this recording, Williams and Wexler offer space soundscapes that are subtly busy in that I could easily close my eyes and be carried away, but close listening often reveals many layers of interesting experimentation with keyboards and guitars. One of my favorites is "Cavern Of Spacezilla", a cosmic journey that combines industrial space soundscapes and dreamy guitars and keys. This tune is followed by "Alfred's Flashback" which is much like the former but a galaxy or two to the left. Across all the improvisations on this disc I sometimes felt like I was in a small underwater craft crawling along the ocean floor, and at others felt like I was floating through space all alone. I met with Williams and Wexler one evening and we chatted about the band and their music. AI: The first question that begs to be asked is why form National Steam? How do you see it as being distinct from Quarkspace? PW: I guess from a logistical standpoint with Quarkspace being partially separated across the beautiful Miami valley, Dave and I being local to Columbus tend to get together and work on music a bit more often. I like to play keyboards a bit too and don't get to do that too much with Quarkspace. Sure its kind of vague, the relation to Quarkspace. The music is different, but if you apply it to Hot Tuna and Airplane, with Airplane being the mothership and Tuna being the little banger. Funkadelic and Bootsy's Rubber Band, y'know its the same sort of thing. AI: The thing that hits me most as a listener is the National Steam I've heard off the first two cassettes is less jam rock, more ambient, more sound exploratory. You're the obvious difference with the keyboards, but is there any other needs that it meets for you as musicians that you can't meet in Quarkspace or is it really just the convenience thing? DW: I think you've got a point there, it does kind of let us go... sort of self indulgent to some of the sound effects and things like that that we can go more fully into or experiment more with when its just the two of us. AI: I guess if you have just two people bouncing ideas off each other it might be easier than the diplomacies involved in working with five people. PW: Yeah. I think that Steam... on the CD there's 35-40 minutes of just total improv trippy space and I think we recorded all that in one day. I mean its not in the same order because the space is broken up and mixed a little bit. But on the songs I think there was a little more meticulous effort in the construction and recording of the songs than was evident on the last Quarkspace CD. Better toys too. AI: You've got some stuff that's no percussion don't you? PW: The interesting thing is now Quarkspace has become a little bit more Steamesque because I'm playing keys with Jay on stage. If I'm playing keys with Jay its going to have a little bit freakier feel to it. DW: Another difference is probably in the vocals too. Quarkspace has a percentage of songs that have vocals. I don't think that Steam has many vocal songs and if we do its just with a couple "ahhhhs" or something like that. PW: There's four songs with vocals on the new CD, but I don't know if we're going to do those live. Who knows. Maybe "Orion". But one of the cool things about our version of the Kantner tune which we hope will get released.... Paul Kantner if you're listening please call me! One of the cool things about that is Joie Conroy from Ut Gret just did his vocal style on that and its really cool and it adds a distinctive flavor to it. And some of the more complex pieces on there are more studio type pieces that I don't know if we'd be able to play live unless... I don't see myself growing four arms to play drums and keyboards at the same time on a lot of that stuff. And since Quarkspace is the mothership and our prime focus, and this is our little side project, I don't see us playing a full National Steam experience. AI: Your music seems to transcend any real labels. But reviews, and even your ads point in the spacerock direction. You're not straight trance ambient, you're not straight heavy spacerock. You kind of fall in a middle ground. How do you really view yourselves? PW: We're spaaaaace. I mean the space is the common element with all the stuff that you're mentioning. Spacerock can be hard driving Hawkwind like you say with the freaky bits. Or it can be the loopy jazzy Gong with the freaky bits. Steam maybe is more just the freaky bits. But its space. DW: A lot of it is we've all been playing so long there's a number of different backgrounds and styles that all gets drawn on when we're jamming. Depending on the direction the music takes there's always something you can draw on. I'd just assume try to break down some of that compartmentalization where you just fit into this little slot, you can't go anywhere else and people listen to music in that slot and don't listen to anything else. AI: You've also referred to having new "toys" on new releases and I can certainly hear things from one tape to the next. In reviews I refer to the tapes in your quarterly series as part of your music diary or journal. Is that the way you look at it as well? PW: Sure. We're definitely considering discontinuing the cassettes and replacing it with a twice a year 60 minute self-produced CD. That's something we're tossing around. We think we'll get a better response if they're on CD. Maybe we'll do that with Steamdream 3 cause we've got a lot of killer space that we did with Joie. And my friend Nathan from the New Druids, our late 80's-early 90's Columbus band, got together and did some jamming. AI: There's a large element of imagery in your music. Like "Pennsylvania Special" and "Tronhop Groov". "Pennsylvania Special" completely reminded me of when I was train traveling. PW: Thats interesting because "Pennsylvania Special" is about an old train, I think in the mid-1800's, that won one of the first speed awards. "Tronhop Groov", in the old time honored Quarkspace/National Steam style, is something that first appeared as an improv on one of the Spacefolds tapes. And you listen to it when you're mastering the tape, and making all these tape copies and it sticks in your craw... well that has now become "Orion". "Orion" was inspired lyrically from the trip back from the first time Quarkspace played at Orion. [Ed. Note: referring to Orion studios in Baltimore, MD.] And on the way back it was the comet. Ummm... Hale-Bopp. We're driving back in Maryland and there it is. So we pull off the road. And there's the comet up there and that's what the lyrics are about. So thats definitely a sort of a journey freaky thing with the imagery. DW: But in another sense I look at it as the song or the music itself is like a journey. Travelling around to different little places. You never know what you're going to hear or when you get there. AI: I could see you guys having a hell of a career doing soundtrack music. PW: My sister-in-law works for the Cleveland Center of Contemporary Art and she has a couple options I've tried to look at. I'm trying to find a couple publications that are more amenable to that... its something we're taking a look at. Its kind of hard to do all this stuff ourselves. DW: We'd love to do movie soundtracks. Any offers? PW: One contact we do have is the managing editor for a computer gaming magazine so that's some options we're going to explore possibly doing some computer game soundtracks. AI: [To Dave] I've only found out recently that you've released some tapes of your own. Is this solo guitar stuff? DW: Right. Three in the morning, sitting up with the effects and the delays going. Let the tapes roll kind of like we do with Steam and Quarkspace. And every once in a while you get a few good minutes and thats pretty much what the two tapes I released are from. The best of the late night minutes. Its all improv. Its really fun to do that kind of stuff because when you're playing with these long delay loops what you play is going to repeat back in a couple seconds. And you're walking a tightrope between the past and the future. What you're playing now is going to repeat back and yet what you're playing you've got to kind of set up for what's ahead. Its almost like you're a conduit or a channel for some musical force and yet at the same time its very mentally absorbing because you have to execute the ideas that are coming to you. You don't have long from moment to moment. You have this idea maybe the next two bars ahead or four or five seconds. I could go here... or it could go there kind of thing. And somehow you've got to convert that down into the actual movements of your hands and things like that. I'm working mentally very hard to keep up with it and keep it going. AI: What's the difference between doing that on your own and when you're improvizing with other people? DW: Its similar but one of the differences is you have, of course, all the other people to play off of and pick up ideas from. You're not responsible for all the music yourself. You can have an idea and carry it for a while and then drop into the background a little bit and then let somebody else hopefully pick the ball up. What's interesting is you kind of get on a different level of inspiration depending on what's going on. I've never been able to figure out what the common denominator is. But often the tapes we release were all just recorded straight through. We just had a "good night" so to speak. And what causes those good nights to come about I've never been able to figure out. Especially when you're doing the improv music you rely on inspiration hitting you. Some nights it hits you stronger than other nights. To bring us back to the Steam CD, its about 50% improv, and yet the other half is well planned thought out studio type tracks. AI: Do you like balancing things that way? DW: Yeah, its nice to do it both ways. One of the neat things about doing the studio songs was because we are for the most part just doing improv, this was the first chance we've had for these guys to sit down and develop parts as opposed to just whatever came out of your one chance at getting a take. Although most of the solos and things like that on the studio tracks came about as a result of the same type of improvisational process. For more information and to hear sound files you can visit National Steam at their web site.